Flying out of Denver, CO, USA on January 26th to start the first leg of my journey south to Antarctica, I admired the beautiful mountain landscape covered in half a foot of fresh white powder that had fallen the day before. Fifteen hours later, I debarked into the Santiago, Chile, cradled between the mostly snowless peaks of the Andes. With my winter clothing on, stepping off the plane into the record breaking 40°C summer day sent me scrambling to take off some layers. It almost slipped my mind; there is a second half of the planet and it never sees a white Christmas. After a long layover in the swarming airport and another 4-hour jog, we descended into Punta Arenas, Chile, I found myself looking onto a windy landscape, covered by pockets of water and, bordered by the glistening Straits of Magellan. Punta Arenas is the gateway to the famous Torres del Paine and the launching point for research cruises headed to the Antarctic Peninsula and West Antarctica. 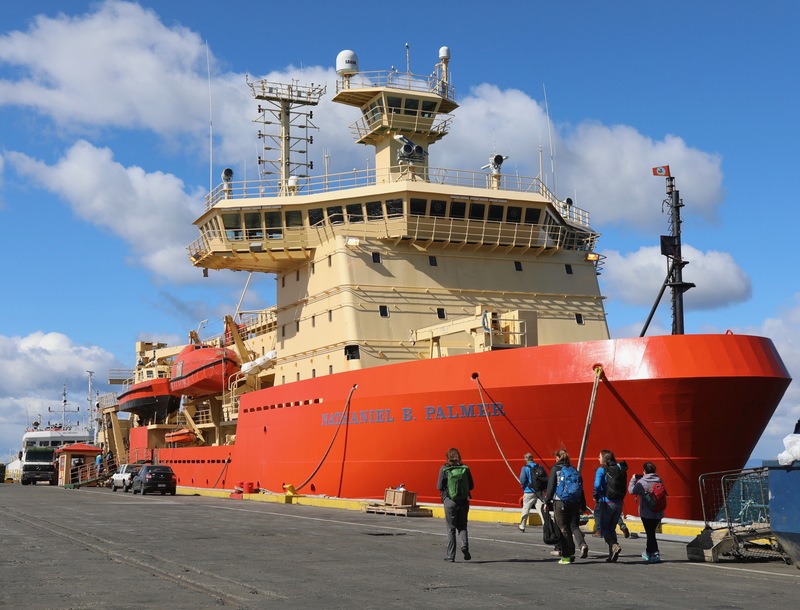 For the moment, it served as the temporary berth for the RVIB (research vessel ice breaker) Nathaniel B. Palmer, the new home to 25 scientists and myself for the next two months on a journey to conduct research at the Thwaites Glacier. Before I go further, let me introduce myself. My name is Tasha Snow and I am a PhD student and glaciologist (glacier scientist) at the University of Colorado Boulder. Like many people in Boulder, I am a fanatic for everything outdoors: honestly, you name it. My two addictions are tasty food and problem solving anything, and you can often find me in my free time cuddling on the couch or tossing a frisbee with my Golden Retriever, Lily. Unlike most people, my love and work is of water and ice. I use satellite imagery to study how glaciers and oceans interact and have changed over time. Maybe my last name sealed my fate for me, but I would be more likely to point to my first glimpse of Antarctica that did it. It’s impossible not to fall in love. I think if you continue following the cruise, you will understand why. While I am a scientist, my work on the Palmer takes a different form. For the next two months, I will be the resident media facilitator, working as a liaison for the three media personnel onboard and the scientists. I will be helping to ensure they are able to capture and provide to you, the stories of the crucial International Thwaites Glacier Collaboration (ITGC) research. You will also get a glimpse into the personal journeys of the researchers and ship’s crew that make it all possible. Carolyn Beeler is the environment reporter for The World, a daily, nationally-distributed public radio show based in Boston, and for Boston Calling, its sister program that airs on the BBC World Service. Jeff Goodell is a contributing editor for Rolling Stone Magazine and a book writer. National Science Foundation has also funded a creative non-fiction author, Elizabeth Rush Mueller, to join through the NSF Antarctic Artists and Writers Program. A fellow scientist, Linda Welzenbach, will be serving as the outreach and documenting specialist for the THOR group. They will all be putting out periodic reports and blogs from the ship that will be linked to this site. The media will also have longer edited pieces and books that make it out to you once we return home. Make sure to keep an eye out for them as well. We have an incredible group headed down to conduct science and help document all of the discoveries we make at Thwaites. Researchers from THOR will be collecting ocean sediments to tackle questions of past changes at Thwaites spanning back thousands of years. The TARSAN group has its sights set on exploring the ocean properties near Thwaites with a range of cutting edge technologies, including the Hugin autonomous underwater vehicle and instruments tagged to seals – Austin Powers will be put to shame. Alongside the other groups, GHC scientists will seek out rock debris, penguin bones, and molted seal hair at ancient exposed beaches that will help will help determine the area's glacial retreat and expansion history. The vibrant scope of research planned for this cruise will make every day an uncharted adventure. Now, in the gateway town to the Antarctic, we have our stepping off point for the rest of the journey, soon to be made over the waters of the Drake Passage. Stay tuned.